The good news: we have a highly-detailed digital template for how to rebuild. The world watched in horror Monday night while flames tore through the Notre Dame Cathedral in Paris. As fire consumed the roof and toppled its iconic central spire, it seemed as though the historic church could be lost forever — but it’s possible, thanks to cutting-edge imaging technology, that all hope may not be lost. Thanks to the meticulous work of Vassar art historian Andrew Tallon, every exquisite detail and mysterious clue to the building’s 13th-century construction was recorded in a digital archive in 2015 using laser imaging. These records have revolutionized our understanding of how the spectacular building was built — and could providea template for how Paris could rebuild. 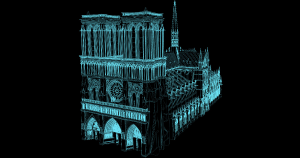 In 2015, National Geographic profiled Tallon and his unique scanning process, highlighting his digital imaging of the Notre Dame Cathedral. For centuries, the only tools we had to measure medieval buildings and structures were primitive — strings and rulers, pencils and plumb bobs — but by turning to 21st-century technology, Tallon was able to tease out the secrets of this miraculous structure. According to The New York Times, it took less than an hour for the fire to spread from the attic of the cathedral and engulf the roof, toppling the central spire. Construction on the cathedral began in the year 1163 and finished in 1345, according to an NYT piece about the history of the cathedral, and the wooden roof contained historic beams from the year 1220, all of which were destroyed by the blaze. Despite the extensive damage, the NYT reports that most of the priceless artifacts and the stone structure of the cathedral remain intact — though only time will tell how long it’ll take to restore the beloved structure to a semblance of its former glory.